With fresh bandages on their arms, blood donors rushed home from Kettler Iceplex Sunday to sell the bobbleheads they got in exchange for their bodily fluid. Yes, it’s that time again, the Capitals’ spring blood drive. 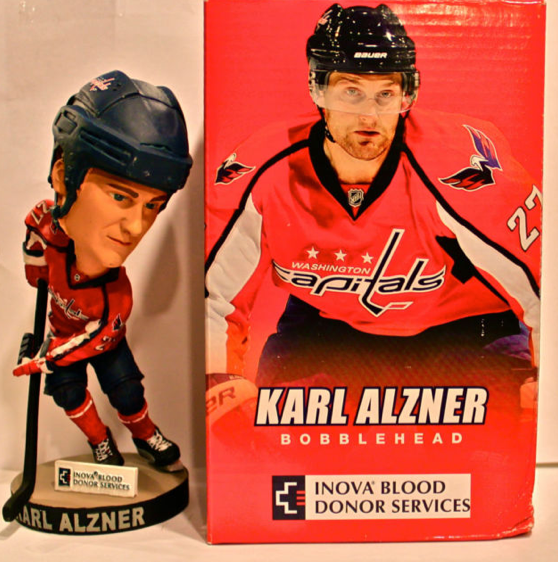 This year, the parting gift was Karl Alzner‘s wobblin’ noggin’, the first Capitals bobblehead given out since the six-pack gift set to season ticket holders this year. Since the Inova Blood Drive bobbbleheads are relatively limited in number (usually just a few thousand, as opposed to 19,000 for stadium giveaways), and only available through the blood drive, they tend to fetch a handsome price from those who MUST HAVE CAPITALS BOBBLEHEADS. For a popular player such as Alzner, I’d estimate early sellers will get $100 or more. See the listings here. The last blood drive bobblehead given out was Michal Neuvirth back in November. Who Will Get the Next Bobblehead? Any Cap not listed here has already been immortalized (even Jeff Schultz) though it’s possible that they’ll make ones we’ve already seen again. Like we all need another Ovi. Oh, and though I like the guy, pretty sure Keith Aucoin won’t be in the running. Maybe as a Bear. Arnel Pineda performed wearing a T.J. Oshie T-shirt. 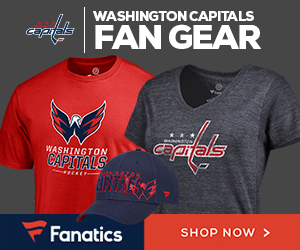 Be the envy of the entire Capital One Arena.